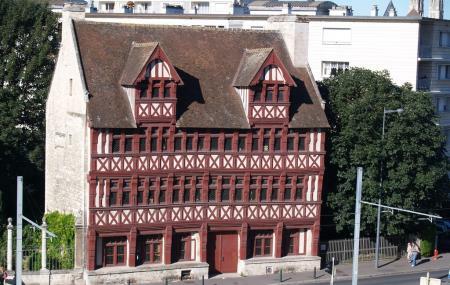 La Maison des Quatrans is another of the many wooden houses from the 15th century. These were the most notable of all times. The body of house has stones and are mounted in front of timbered corbelled. This manufacturing technique had been applied until 1524, when a decree of the Parliament of Normandy banned corbelled constructions for taking hygiene and safety measures. There are beams decorated with sculptures and plasters decorated with small statues for a striking view. Many eateries and restaurants are available. How popular is La Maison Des Quatrans? People normally club together Memorial Of Caen and Mondeville 2 while planning their visit to La Maison Des Quatrans. Repas copieux et façon maison. Serveur très sympa. Vous pouvez y aller sans problème.